This is our new platform where we comment contemporary issues. It’s created by activists, writers, journalists and visual artists. First issue is dedicated to ecology. 500 copies of this publication is distributed for free and will be available to download online soon. The zine is accompaigned by the series of visual art works in Warsaw’s public space. We form the Sputnik Photos collective of photographers. We take photographs, put up exhibitions, publish art books. We have been active for eleven years, and throughout the period, we have been looking for a new artistic language to express our attitudes to reality. We want to talk about what inspires us, but also what gnaws on us and makes us feel uneasy – not only using the language of photography. All issues of Pages will focus on a single topic. We have invited writers and visual artists to contribute. We decided to dedicate the first issue of Pages to the environment, entrusting the concept and production to Michał Łuczak. I can only use to this effect the tools I know. Naturally, my gestures will not be of the large-caliber type, but I believe – perhaps naively – that even such small platforms as Pages can make a difference. In the first issue of Pages, Jacek Karczewski writes about the great massacre of birds by humans, Marta Sapała about the relief our climate needs so dramatically, which – as she believes – is within our reach, while Aneta Prymaka-Oniszk describes the environment we create on a day-to-day basis by speaking and writing. Filip Springer looks at the geological strata hidden under the Suwalski Landscape Park, Olga Gitkiewicz walks about the city, and Michał Książek writes to us from the very heart of the Camp for the Białowieża Forrest. Tosia Piechota, a seven-year old girl, makes her debut in Pages with her owl graphics. The issue also features Jacek Frąś, whose comics close the first issue. The zine will be accompanied by city-space billboards with works of the visual artists Diana Lelonek, Joanna Rajkowska, Michał Frydrych, and Andrzej Tobis. There will be three issues of Pages in 2017, with a debate accompanying each issue. 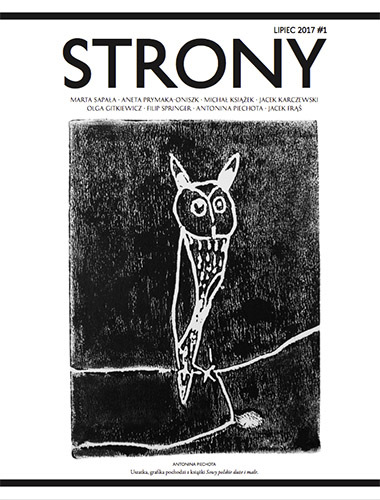 The polish version of “Strony” is to download HERE. For your donation we offer you one of Sputnik collective book or Sputnik photographer's monographs in return. Your donation supports our activities like on-going projects or up-coming photobooks. Thank you! © 2019 Sputnik Photos. All Rights Reserved.